Did you play with Gak as a kid? Have you ever made any? ……and then squish their little fingers into. Then gathered all of my supplies. Then started adding the liquid starch a little at a time. Then let those little chubby hands test it out. And play and giggle their little hearts out. soo cute. i have to file this one away for those rainy summer days. That looks like a great project for my kids, but what is liquid starch and where do you find it? Where the heck is that?!?! You can make your own liquid starch with 2 cups of cold water and 1tbs of cornstarch. Mix it together and there you go, liquid cornstarch. Rebekah, I bought the starch at Wal-Mart in the laundry detergent aisle. It was next to the static cling and scotch guard type stuff, way down on the bottom shelf. very vibrant color! absolutely love it! i'll try it out soon! so fun! i have this in my summer fun file..love it! I've never used starch to make this. We always use Borax. We'll have to make this again sometime trying your method! Oh how fun! I need to do this! My kids would love it! I like this because it is less toxic than the recipe with the borax. I'm going to make this with my 3 year old. It looks like so much fun!!! Does the food coloring stain anything once it's been mixed in? Thanks for sharing this recipe. I always made "GOOP" using powdered starch, but I cannot find powdered starch anymore. I have taught Kindergarten Sunday School for over 20 years & I always make GOOP at the beginning of the new year. I was so sad that I wouldn't have it anymore. I hope this will turn out similar – I can't wait to try it. We also "paint" with liquid starch using 1 inch squares of tissue paper. Ashley! What is your table top in the last pic. I love it! And GAK! HOW FUN! Might have to try this! Are you crazy about them not getttin it on the carpet or fabrics… my mom distinctly remembers us messing stuff up with our fun GAK! I had to smile when I saw the Sta-Flo starch…since I work for the company that makes it. I love this recipe and am always impressed with the polymer interaction between the glue & starch! that looks so fun! we're definitely doing this if it's still rainy tomorrow! I have made this but using Borax. I love it because it does not make a mess like playdogh does. Its easy to clean up (just dont get it in your carpet). my kids like to put a straw in it fold it over wait for a few seconds for it to seal itself then blow huge bubbles. We made some flubber last week! Yes, it can stain because it has food dye in it. And the gak stuff can get stuck in fabric if smooshed into it. But it doesn't come off on their hands. I only let the kids play with it at the table….and stay around while they're playing with it. But it sure is a lot of fun….even for me to sit and play with. It's just a gooky, smooth, rubbery, ball of fun. Thanks for sharing! Definitely one to save for a rainy day when you can't take the whining anymore! Thanks for sharing! That's so cool! I loved Gak! My daughter just made this at preschool and we made it at home too! It was so fun. Borax does work really well. That's what we use. Fun! My son made something this at Science Central when he was young and it was around Dr. Seuss's birthday and they called it Oooblek. If you have kids and have never tried it I highly recommend and I love the pictured step by step tutorial that will make it easy for younger kids to understand – they get so much more excited when they "make it all by themselves" then have to have Mom or teacher intrepret the instructions for them. I think my kids would love this. I'll have to try it. Saving this recipe for future use! I have never even heard of this, but I think its what in Australia we call 'sludge'. Fantastic! OMG, it reminds of what happens to a giant laffy taffy bar when it sits in the sunny car for a few hours. Goo! my son made some of that at school earlier this year. great stuff. he said you have to be a really good squisher for it to come out right! I need to make this with my grandchildren! Thanks for the demo! I'm a preschool teacher and we've made this a couple times, but please be careful. It can get stuck on clothing and we had a little girl who got it stuck in her hair and the only way to get it out was to give her an impromptu and very uneven haircut. Just make sure you use with supervision if you have little ones. Thanks so much for all the great ideas! Don't tell anyone but your my favorite! Do you know how long this stuff will keep and what best to store it in? Rochelle, I have had mine for over a month stored in a ziploc bag and it got a little stickier over time. But I just added more liquid starch to it and let the kids play with it again. And then it was fine. hope that helps! I too had crazy kids that got this stuff stuck on their clothes. Mix equal parts of vinegar and water and it basically dissolves the stuff!! My heart breaks for the little girl that had to get her hair cut!!! As I posted on stumble, this is actually ooblic. 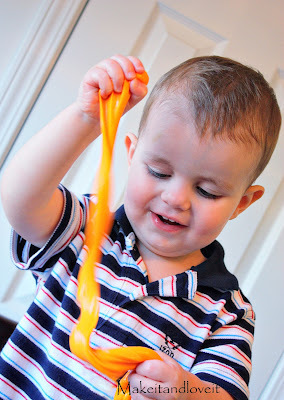 Gak is different and can also be made easily with different household things (borax, water, and elmer's glue). http://www.ehow.com/how_4987667_make-gak-borax.html tells you how. ooblic is more liquid, turning solid in motion while gak is more solid and a bit bouncy. Let the kids draw on it with markers, really cool! Can you store GAK? If so for how long? Una idea genial, yo lo hice con lavavajillas en vez de almidon, y borax, pero no me salio muy bien. i don’t have a walmart in my town. I actually found the Sta-Flo at my local Kroger. Check out the website I found on whether Borax is safe or not. Borax is not boric acid (unlike what many sources say). Actually, she’s got some misinformation there. “Borax is not boric acid. So if it’s ingested, it becomes boric acid (we have acids in our body too!). So them classifying it as level one is not very reassuring! There have also been some studies linking it to reproductive issues and fertility problems, along with birth defects (especially of the male reproductive organs). Special Remarks on Chronic Effects on Humans: May cause adverse reproductive effects. Acute Potential Health Effects: Skin: Dust causes skin irritation. Poorly absorbed through intact skin. Eyes: Dust causes eye irritation. Inhalation: Causes respiratory tract irritation. Ingestion: Acute toxic effects of borates in general are nausea, vomiting, diarrhea, and delayed skin redness, rash, and dizziness. Chronic Potential Health Effects: Chronic exposures can produce eye irritation, coughing, and skin rash (the latter following ingestion). She points out that borax is “only” classified as level 1 for health problems, but I think she may misunderstand the rating system. Level 4 can kill you immediately. Level 3 can cause permanent disability if you interact with it. Level 2 substances can cause lingering injuries or “temporary incapacity.” Level 1 can cause “significant irritation.” Yes, that’s better than death, but do you want to give a small child something to play with that contains a natural pesticide that can cause “significant irritation”? Safe materials are level 0. “Based on our hazard evaluation, the following chemical substance(s) in this product have been identified as hazardous. I wrote about borax on my website years ago (http://magicalchildhood.com/articles/borax.htm) and I continue to get angry letters from people who are upset that I advise against putting borax in children’s craft recipes. People get really worked up in these letters, and it confounds me. The starch in this recipe contain sodium tetraboride, which is Borax. I just made this with my 2 year old. She loves it! Thanks for sharing! I have featured it on my blog. what is a good way of getting out of cloths?? the gak not the food coloring? Someone above said equal parts of vinegar and water… Hope that helps! Does this stain if it gets on a wall? It looks like it might. This looks lik so much fun! I can’t wait to try it with my family! Thanks a lot! I just am this today for my 5 year old and 3 year old and let me tell you there was MUCH giggling going on! You would actually be better off using straight borax rather than having the addition of a few other toxic ingredients. Actually, borax is not as toxic as some people thinks, as there are several blogs and websites around the internet that have confused boric acid (extremely toxic) with borax. If you do a bit of deeper Googling, you can find out more information. The dangers of poisoning from small amounts, risks of infertility and dangers to unborn children all refer to boric acid, not borax, but so many people have misunderstood that and put it out as the dangers of borax. You can also check the 20 Mule Team Borax MSDS (Material Safety Data Sheets). Borax, though related to boric acid, is quite different in chemical make up, and must be ingested in large quantities to do any harm, and even though it typically only causes “gastrointestinal distress.” However, it is still advisable to keep it out of reach of children and away from food. Either way, once you have made slime/flubber/gak/goop/putty or whatever name you want to call it, the borax is no longer in its original form. It combines with the polyvinyl alcohol in the glue and forms a polymer chain — it turns into a plastic. This is a chemical reaction. A chemical reaction means that the different items have combined and turned into something completely new and different. Now you no longer have glue or borax, you have now made your very own plastic. I taught Environmental Science/Environmental Education for ten years. and made slime tens of thousands of times to teach chemical reactions and the nature of plastics. Yes, that many, as I worked with about 6,000 students per year. The way I did it was to make up gallons of borax and water solution, along with glue and water solutions, and put them in bottles with pumps. I could then have the students put a pump full of each solution into a zip close plastic baggie, and then knead and squish the baggy until the slime formed, at which time they could remove it from the baggie to continue forming it and playing with it. Now, no longer borax or glue, they have a relatively safe product that doesn’t irritate skin with minimal contact with the borax. Thanks for sharing a non-borax recipe. We just finished playing with it. So much fun for everyone. My 2 year old was giggling the entire time and the 4 year old just kept saying how cool and crazy “this stuff” is. My kids like to play with it in the tub. I like how it turns out when clear glue is used. that is so cool just made it and it was awesome but how long will it stay gooey! Hey Ashley, what do you have on your table to help with the mess?? I love gak but I haven’t got any or made any. I tried it but with laundry soap and it didn’t work where could I find starch Walmart?? ?